I have always loved the ’55 Chevy. 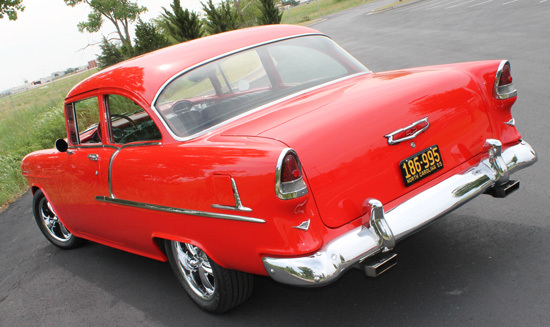 As a small child of five, my parents bought the one and only new car they ever owned– a ’55 Chevy. I think that’s when I really became hooked. During my younger days, I had owned three of these fine automobiles. But as life may have it, I joined the Air Force, went overseas during the Vietnam War, got married and started a family. As a matter of fact, in 1979 I drove my first wife to the hospital in a ’55 when my oldest child, Travis, was born. In looking back, if I had only known then what I know now, I would have worked out a way to keep those fine rides. The first thing I did was contact a good friend of mind, Jimmie “T” Fraley from Denton, NC. Jimmie has a lot of knowledge about Tri-5s. He has a beautiful ’56 Chevy and I asked him if he would help me with the modifications that I had in mind. He agreed and the transition started. 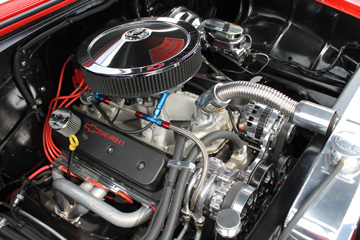 I bought a ZZ383 Stroker Crate Engine from City Chevrolet in Charlotte, NC, and “T’ did the installation. The engine came with 450 hp, 450 lbs-ft of torque, roller rockers, a roller cam and aluminum heads– right out the box. Then came the new 500 Series Steering Box, dual exhaust system and Hedman Hedders. And I just had to have the new custom built radiator, fan and condenser from Tapp, Inc., out of Sophia, NC. I also replaced the transmission with a Tremec TKO-600 5-speed, along with a new Hayes Clutch and pressure plate, for great cruising on the highway. 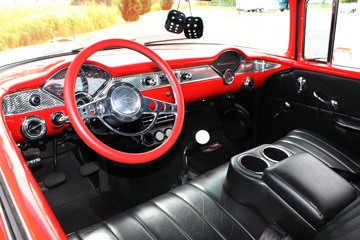 For comfort, we added Vintage Air, an ididit tilt chrome steering column, and a Dakota red and black carbon fiber dash and clock to match. The clock sits in the right side of the dash, so the passenger can see not only the time, but can switch to the other measurements, including the speed– which sometimes is not so good when the wife is riding along (if you know what I mean!). Finally, I added a set of Ridler 17” x 7” chrome wheels and Michelin tires to complete the look and add to the great ride. I have been to several Eckler’s Car Shows including Orlando, Cleveland and Norman, Oklahoma. The ’55 has been judged 3 times and has received a Platinum Certificate and a 1st place win in the 1955 Custom Senior Division. It scored 995 out of 1000 points at the 23rd Annual Winter National held in Orlando in February of 2015. We just returned in July from Eckler’s 38th International Convention in Norman, OK, where I entered the Cruiser Class and won Best of Show in that division. The ’55 has always been my dream car and I really enjoy driving it and going to car shows and cruise-ins. As I have always said, you meet the nicest people at car events. I hope to be driving it for many more years. A special thanks to my wife, Virginia, for her support and putting up with me during the transition period, and to “T” Fraley for being the best mechanic around! We also have a ’64 Impala SS that has appeared in Chevy Classics, twice. If you are ever in Charlotte, NC, feel free to look me up. I can almost guarantee you will find me in my garage wiping down the ’55 or ’64, or driving to a show or cruise-in!